Sucralfate Oral Suspension contains sucralfate and sucralfate is an α-D-glucopyranoside, β-D-fructofuranosyl-, octakis-(hydrogen sulfate), aluminum complex. 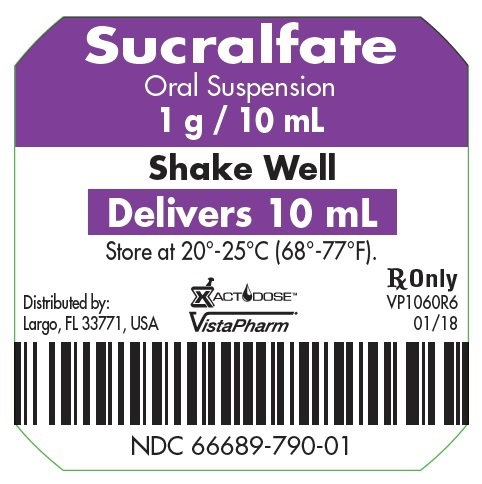 SucralfateOral Suspension for oral administration contains 1 g of sucralfate per 10 mL. SucralfateOral Suspension also contains: colloidal silicon dioxide NF, FD&C Red #40, flavor, glycerin USP, methylcellulose USP, methylparaben NF, microcrystalline cellulose NF, purified water USP, simethicone USP, and sorbitol solution USP. 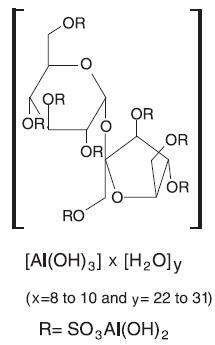 These observations suggest that sucralfate's antiulcer activity is the result of formation of an ulcer-adherent complex that covers the ulcer site and protects it against further attack by acid, pepsin, and bile salts. There are approximately 14 to 16 mEq of acid-neutralizing capacity per 1 g dose of sucralfate. In a multicenter, double-blind, placebo-controlled study of Sucralfate Oral Suspension, a dosage regimen of 1 gram (10 mL) four times daily was demonstrated to be superior to placebo in ulcer healing. Equivalence of sucralfate oral suspension to sucralfate tablets has not been demonstrated. Sucralfate Oral Suspension is indicated in the short-term (up to 8 weeks) treatment of active duodenal ulcer. Sucralfate Oral Suspension is contraindicated for patients with known hypersensitivity reactions to the active substance or to any of the excipients. Fatal complications, including pulmonary and cerebral emboli have occurred with inappropriate intravenous administration of Sucralfate Oral Suspension. Administer Sucralfate Oral Suspension only by the oral route. Do not administer intravenously. The physician should read the “PRECAUTIONS” section when considering the use of Sucralfate Oral Suspension in pregnant or pediatric patients, or patients of childbearing potential. Episodes of hyperglycemia have been reported in diabetic patients. Close monitoring of glycemia in diabetic patients treated with Sucralfate Oral Suspension is recommended. Adjustment of the anti-diabetic treatment dose during the use of Sucralfate Oral Suspension might be necessary. When sucralfate is administered orally, small amounts of aluminum are absorbed from the gastrointestinal tract. Concomitant use of sucralfate with other products that contain aluminum, such as aluminum-containing antacids, may increase the total body burden of aluminum. Patients with normal renal function receiving the recommended doses of sucralfate and aluminum- containing products adequately excrete aluminum in the urine. Patients with chronic renal failure or those receiving dialysis have impaired excretion of absorbed aluminum. In addition, aluminum does not cross dialysis membranes because it is bound to albumin and transferrin plasma proteins. Aluminum accumulation and toxicity (aluminum osteodystrophy, osteomalacia, encephalopathy) have been described in patients with renal impairment. Sucralfate should be used with caution in patients with chronic renal failure. The mechanism of these interactions appears to be nonsystemic in nature, presumably resulting from sucralfate binding to the concomitant agent in the gastrointestinal tract. In all cases studied to date (cimetidine, ciprofloxacin, digoxin, norfloxacin, ofloxacin, and ranitidine), dosing the concomitant medication 2 hours before sucralfate eliminated the interaction. Due to Sucralfate Oral Suspension's potential to alter the absorption of some drugs, Sucralfate Oral Suspension should be administered separately from other drugs when alterations in bioavailability are felt to be critical. In these cases, patients should be monitored appropriately. Teratogenic effects. Pregnancy Category B. Clinical studies of Sucralfate Oral Suspension did not include sufficient numbers of subjects aged 65 and over to determine whether they respond differently from younger subjects. Other reported clinical experience has not identified differences in responses between the elderly and younger patients. In general, dose selection for an elderly patient should be cautious, usually starting at the low end of the dosing range, reflecting the greater frequency of decreased hepatic, renal, or cardiac function, and of concomitant disease or other drug therapy (see DOSAGE AND ADMINISTRATION). This drug is known to be substantially excreted by the kidney, and the risk of toxic reactions to this drug may be greater in patients with impaired renal function (see PRECAUTIONS; Special Populations: Chronic Renal Failure and Dialysis Patients). Because elderly patients are more likely to have decreased renal function, care should be taken in dose selection, and it may be useful to monitor renal function. Post-marketing cases of hypersensitivity have been reported with the use of sucralfate oral suspension, including anaphylactic reactions, dyspnea, lip swelling, edema of the mouth, pharyngeal edema, pruritus, rash, swelling of the face and urticaria. Cases of hyperglycemia have been reported with sucralfate. Active Duodenal Ulcer. The recommended adult oral dosage for duodenal ulcer is 1 gram (10 mL) four times per day. Sucralfate Oral Suspension should be administered on an empty stomach. Antacids may be prescribed as needed for relief of pain but should not be taken within one-half hour before or after Sucralfate Oral Suspension. Elderly. In general, dose selection for an elderly patient should be cautious, usually starting at the low end of the dosing range, reflecting the greater frequency of decreased hepatic, renal, or cardiac function, and of concomitant disease or other drug therapy (see PRECAUTIONS Geriatric Use). Call your doctor for medical advice about side effects. You may report side effects to VistaPharm, Inc., at 1-888-655-1505 or FDA at 1-800-FDA-1088 or www.fda.gov/medwatch. (NDC 66689-790-01), packaged in 3 trays of 10 unit-dose cups each. (NDC 66689-790-01), packaged in 4 trays of 10 unit-dose cups each. (NDC 66689-790-01), packaged in 5 trays of 10 unit-dose cups each. (NDC 66689-790-01), packaged in 10 trays of 10 unit-dose cups each. Store at controlled room temperature 20° to 25°C (68° to 77°F); excursions permitted between 15° to 30°C (59° to 86°F). [See USP Controlled Room Temperature].